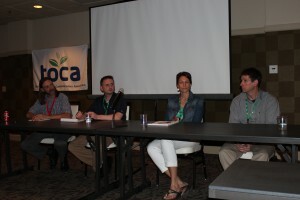 At the 2016 TOCA annual meeting, a panel discussion addressed industry trends and provided insights to help with professional development. Two editors and two PR professionals met up on the final day to dissect the evolving relationship between the two professions. Brian Horn with Lawn & Landscape and Gregg Wartgow with Green Industry Pros represented the media, while Sara Bojar with Bader Rutter and Matt Gersib with MGPR spoke on behalf of the PR industry. It was a healthy conversation that generated a lot questions, comments and ideas. Traditional PR has taken a backseat to new media. Sponsored content is the new norm. Its about finding a balance that works for the publication, the writer and their client. The news cycle is much shorter than it used to be, and the need for news is ongoing. PR professionals are encouraged to share content, but we need to make sure that its interesting, timely and relevant. New media forces all in green industry communications to know the reader/audience better, but it also allows for more customizable, targeted content. Digital and social media allows for sharing news more quickly, and it gives us the opportunity to react to news much faster. However, pay attention to editorial calendars and material submission dates to ensure accurate communication. Finally, we are all being challenged to do more with less. We need to continue to work together to ensure that we are communicating the right message to the right audience at the right time.